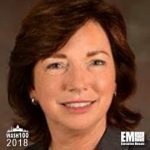 Executive Mosaic is pleased to announce Barbara Humpton, Siemens Government Technologies president and CEO as an inductee into the 2018 edition of the Wash100 — Executive Mosaic’s annual selection of influential leaders in the government contracting arena — for her exemplary work in program leadership and energy contracting management. Humpton, with more than 30 years in the GovCon industry, is no stranger to working effectively in leadership roles at major technology firms. She signed on to Siemens Government Technologies in 2011 as a senior vice president in business development and took on the chief executive role in late 2015. Prior to joining Siemens Government Technologies, Humpton held roles at IBM Federal Systems, Booz Allen Hamilton, and Lockheed Martin. Siemens recently secured a $9.4 million energy savings performance contract (financed in euros) by DZ Bank and United Financial of Illinois to implement energy-efficiency measures at a U.S. military facility in Germany, GovConWire reported Dec. 18. Siemens’ work over the years with the U.S. military is widespread, holding fast to proven methods of collaboration as the company’s energy business expands in new and exciting ways throughout the aerospace, defense and energy environments. “The U.S. Army continues to lean forward in using flexible financing arrangements such as ESPCs to save energy— and taxpayer dollars,” said Humpton. Executive Mosaic congratulates Barbara Humpton and the Siemens team for their selection to receive this award.